HOSCH news is the popular magazine of the HOSCH Group; since 2006 it has been published twice a year, in both German and English. HOSCH news intends to improve the worldwide communication among HOSCH employees and to assign faces to names within the company. It is not only the HOSCH employees in Germany and abroad who eagerly await the publication of each new issue – the magazine is also very popular among our business partners and customers, as it clearly chronicles the steady growth of a global player. 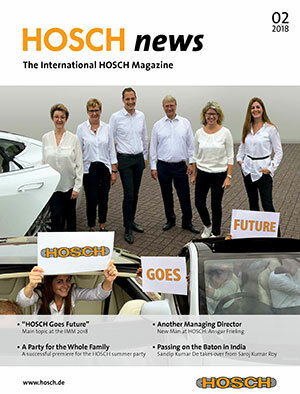 In our archives you can find all the issues of the HOSCH news published so far. Enjoy rummaging through them!